The thyroid is a small gland that is located just below the larynx. It is a vital part of the endocrine system, which is responsible for regulating many bodily functions. The thyroid makes hormones that keep the body’s metabolism regular, and there are several disorders that can come up when the thyroid dysfunctions. 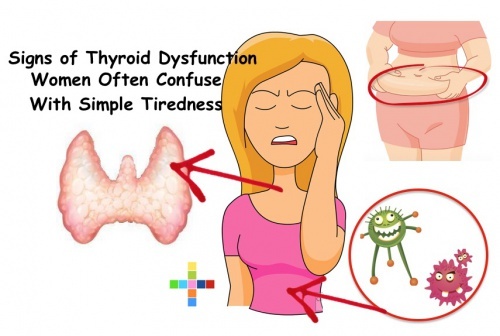 However, sometimes thyroid dysfunctions can be mistaken for other ailments such as simple tiredness or fatigue. The most common thyroid problems are Graves’ Disease, Hashimoto’s Disease, Thyroid Nodules, and Goiter. Graves’ disease is the most common cause of overactive thyroid. This autoimmune disorder happens when the immune system attacks the thyroid gland, causing the gland to produce too much of the metabolism-regulating hormone. This hereditary disease can develop at any age, but is most common in women between the ages of 20 and 30. Some symptoms that may be mistaken for a simple lack of energy are fatigue, irritability, vision problems, and irregular heartbeat. Hashimoto’s disease is the most common cause of hypothyroidism. This mostly occurs in middle-aged women when their immune system attacks and destroys the thyroid gland and causes it to produce too few hormones. Symptoms of this that may be mistaken for simple tiredness are fatigue, depression, weight gain, and intolerance to cold. These growths form on or in the thyroid. The nodules are mostly benign and can be filled with fluid or solid. A small number of these nodules can be cancerous. Thyroid nodules can be linked to Hashimoto’s disease, in which case the same symptoms may occur, making someone believe they are only suffering from normal fatigue. This non-cancerous thyroid disorder is often due to is iodine deficiency. Goiter can be caused by hyperthyroidism. Goiters are most common in women over the age of 40, who are more likely to have other thyroid disorders. Because goiters are often related to other thyroid disorders, it may also come along with a feeling of fatigue. Twenty million Americans suffer from a thyroid disorder of some kind. This accounts for just over 7% of the American population. It is estimated that an additional 13 million people have an undiagnosed thyroid disorder. Those that go undiagnosed are likely to have blamed their symptoms on simple fatigue or everyday tiredness or weight gain. The difficult thing about a malfunctioning thyroid is that oftentimes the symptoms that can occur from either an overactive or an under active thyroid are easily dismissed as a normal, everyday problem. 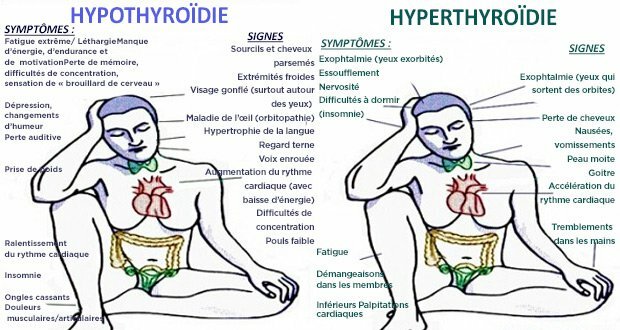 For example, fatigue, which is a symptom of hypothyroidism, is a very common problem in our country. Many people experience increased fatigue with age, and typically attribute their tiredness to things like a busy work schedule or a lack of sleep. Weight gain is also a common problem in adults. Many might blame their weight gain on lack of exercise or over eating without considering that they may have an underlying problem with their thyroid. Each of these symptoms alone do not seem like enough to raise a concern about the thyroid. However, when one symptom is coupled with another, or several others, it may be cause for concern. However, it is common that someone has one or more symptoms of a thyroid disorder without knowing that they may actually have a medical condition. There are some natural ways to keep your thyroid healthy and to treat an under or overactive thyroid. First, going gluten free can be helpful due to the common intolerance to wheat. Wheat may cause inflammation in the thyroid, affecting its function. Following a diet that is free of grains can be helpful. It is also important to avoid BPA, as it disrupts the endocrine system. Detoxing your body of heavy metals is a good way to help thyroid function. This can be done by adding turmeric, milk thistle, cilantro, and chlorella to the diet. Selenium is also a great way to keep the thyroid healthy and can be found in sunflower seeds, beef, onions, salmon, and brazil nuts. Finally, lowering your intake of carbohydrates and replace those calories with healthy fats. Carbohydrates increase estrogen, which in turn negatively affects the thyroid. Healthy fats that balance hormones include coconut oil, avocado, coconut milk, almonds, chia seeds, flax, and hemp seeds.